View More In Loading Ramps. 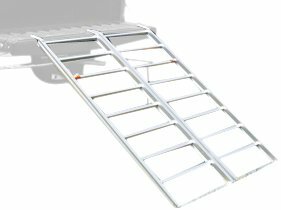 Extreme Max Super Sport Bi-Fold Ramp is built as super light and is extra strong with a 1200 pounds capacity that will take care of all of your ATV loading needs. Comes standard with the industry best push button safety strap. Groove engineered into each section of the rungs allows for the installation of wood or plastic decking for increased versatility when loading all types of equipment. Each ramp is constructed of welded 6063 aircraft aluminum with large traction rungs that are spaces for extra grip. Weighs only 24 pounds, 48 inch in width and 72 inch in length. If you have any questions about this product by Extreme Max, contact us by completing and submitting the form below. If you are looking for a specif part number, please include it with your message.